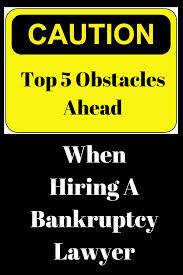 Searching for a bankruptcy lawyer can be a lot tougher than one might think. One of the main reasons for this is that people do not readily refer bankruptcy attorneys to other people because they don’t want to advertise to their friends, family, and co-workers that they had to file for bankruptcy. Thus, people are often left to their own means when searching for a bankruptcy attorney. I have come across several obstacles throughout my 23 years of practice that clients have expressed to me over the years. Do not go with a bankruptcy attorney simply based on the lowest price quoted. When you’re hiring a bankruptcy attorney, you are hiring that person’s knowledge, skill, expertise, personality and ability to get you from point A to point B with as little stress upon you as possible. No two attorneys are alike and no two bankruptcy cases are alike. You’re not simply shopping for a product where you can get an identical one at many different stores. So the first obstacle you need to avoid is the thought that price alone should dictate your decision-making process. Do not necessarily hire someone who is close in proximity to where you live. Many potential clients feel that hiring an attorney is similar to going down to the corner store or local grocery market. What they fail to understand is that bankruptcy law is a specialty under the law. Bankruptcy law is not something that everyone can do when they become a lawyer. In fact, the law has become even more specialized since the law changed back in 2005. For that reason, many attorneys who used to practice bankruptcy here and there, no longer accept cases. Hopefully you never have to file bankruptcy. If you do, you will likely only file once. For that reason, it’s okay to travel outside your local zip code or outside your local municipality to find the right attorney to handle your case; not necessarily the nearest attorney to handle your case. The Internet is full of misinformation about lawyers. There are many review sites which publish false information and refuse to remove it. I know of several review sites that have published false information, which was disputed by the attorney and then not removed. Bankruptcy is federal law and it is public record. If somebody claims to have filed through a particular attorney and is expressing a poor experience, the fact of that filing with that attorney can be verified through the public record. There are some review sites that simply will not do their due diligence to determine whether or not the reviewer is actually being truthful. Since there are so many false reviews, it makes it difficult to discern the good from the bad. For this reason, people looking for a bankruptcy attorney may often be fooled by a false negative or a false positive review about their firm. The consumer has to dig deeper than just relying on the online review sites. Do you really need to file bankruptcy? There are some attorneys who will try to put you into a bankruptcy chapter that benefits the law firm and actually works against the consumer. This is due to the fact that some cases such as chapter 13 bankruptcy cases are more lucrative to the bankruptcy attorney. You as a consumer may really need a chapter 7 fresh start. However, chapter 7 provides less of an attorney fee and thus is not as lucrative for the bankruptcy lawyer. You have to do your research to make sure that the lawyer you see is not trying to force you into a chapter that works against you. For example, if you truly need a fresh start under chapter 7, you certainly would not want to be put into a three-year re-payment plan under chapter 13. Don’t simply rely on what one attorney advises you. You need to do your homework, your research, and talk to more than one attorney before making a decision on which attorney to hire. Getting the entire picture of your case. Whether you file a chapter 7 bankruptcy case or a chapter 13 bankruptcy case, there are difficult complications to each. You want and need an attorney or law firm that is going to explain to you in advance the things that you need to expect going forward. There are pre–filing requirements which must be completed before a case can be filed and there are post-filing requirements which must be completed after the case is filed. You need an attorney that’s going to explain to you all of the details of the case. This includes things that may not happen, but are a possibility in your case. Many attorneys do not provide enough information to educate the consumer as to how the process goes. Many potential clients who filed with other attorneys tell me that they wish they knew about something before it happened. They wish they would’ve known about something so they could have planned ahead. You want to make sure that your attorney is going to explain things fully and thoroughly even if it takes additional time. You are not going to know at first glance whether or not your attorney is going to be thorough. For this reason, you have to talk to different attorneys and meet in person with different attorneys to gauge which one is going to be best for you. As you can see, hiring a bankruptcy attorney is not as easy as you might think. There are many obstacles and pitfalls which make it difficult to really find the right attorney. My strongest advice is to be as detailed and thorough as possible when you are searching for a bankruptcy attorney. If you can avoid the obstacles listed above, you will stand a much greater chance of having a successful bankruptcy case and a rewarding bankruptcy case.